It has been raining non-stop here in Vicenza for the past night and day and night. It is morning now and faced with the scowling skies outside, the right course of action feels to be spending the day snuggled on the sofa not doing much. The operative word here being ‘sofa’. My own blue sofa which we brought with us (together with several other pieces of furniture and all our worldly possessions) all the way from England upon our move to Italy over a year now. They traveled, nicely wrapped and secured on board of a hired van, all through Belgium, Germany and Austria, reaching Vicenza a day before we reached it via a comfortable plane ride in August 2014. Since then, they have been helping us feel at home in our Italian rented flat with the blue sofa taking a pride of place in our minuscule lounge. Daily, the members of our small family would compete for sole occupancy of the blue sofa and with legs nicely stretched and back softly supported by a pile of cushions, leaving those of us who had made it to the lounge a split second later crowded on the smaller mink (as in the colour, not the actual animal) sofa. Other times, we would all snuggle together on the blue sofa, engaged in a shared enjoyment of a cats’ video, a toddler book or simply a deep family chat. As such the blue sofa has become something like the hearth of home for me. Well, in the absence of an actual fireplace in Italian lounges, you take your next best, don’t you?! It is the comfortable little centre of our universe, my own snugly homey nest. It is funny how this summer we followed the exact same route which our blue sofa had taken in August 2014. We left England via a ferry on the Channel and then crossed the exact same countries as it did, albeit we took it slowly over eight days and actually did some sightseeing, which, I am sure, our blue sofa didn’t do. I have to say, after those eight days on the road, which completed the month and a half long journey across Europe we took this summer, it felt good being back home to our blue sofa. For the first week after our return, it felt absolutely brilliant not to have to pack, unpack and repack clothes and other what’s-nots in a large suitcase and several bags on a daily basis. It felt good not to plan daily itineraries and try to cram in as much sightseeing as two adults and a toddler could possibly do without one of us throwing a temper tantrum. And it felt so good not documenting our experiences that I didn’t take another picture for a while and my camera remained firmly in its nice cushioned bag for over a month. 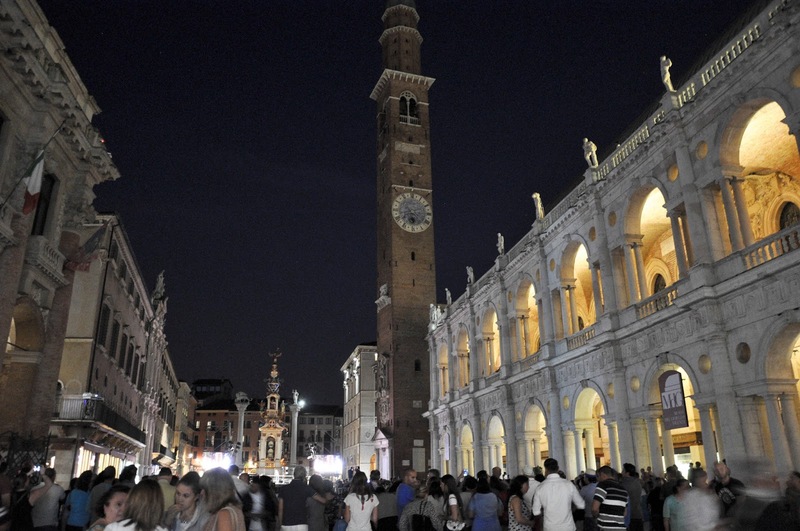 We got back to Vicenza at the start of August – just in time for the fabled ferragosto. This is the Italian holiday season when anyone calling themselves Italian locks shop, puts on their tiny swimming trunks and deserts towns and cities for the best beaches in Puglia. 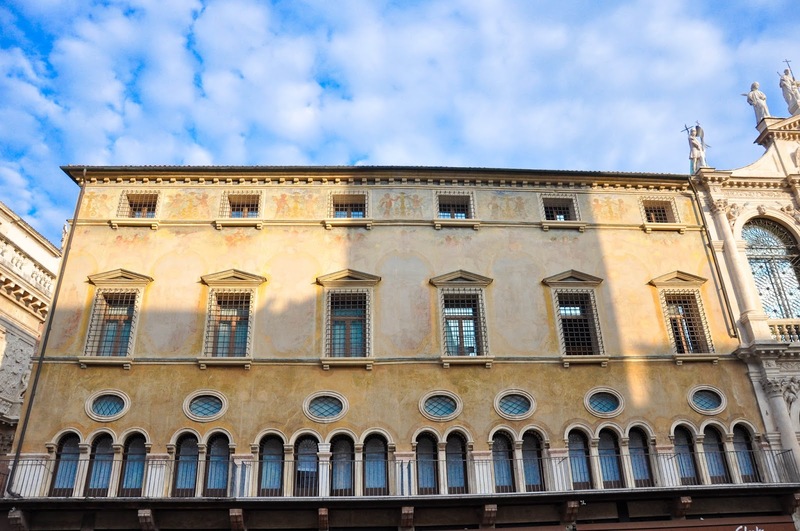 Vicenza was a ghost town for most of August with empty streets and window shutters tightly shut. 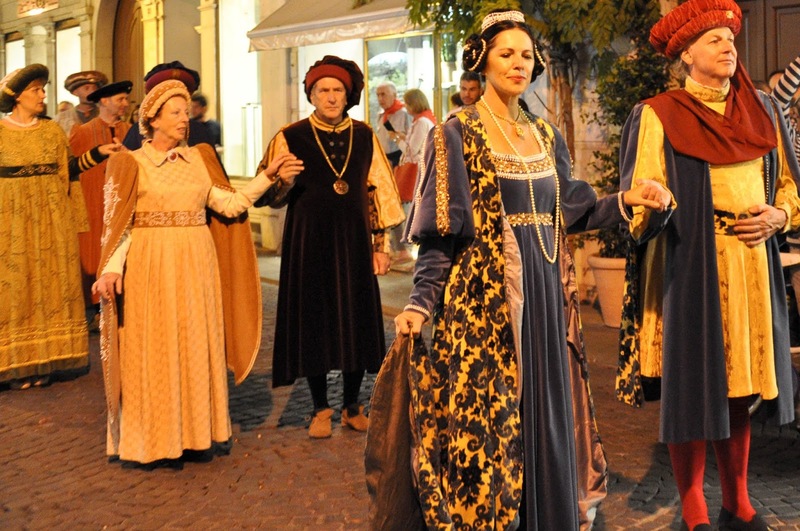 Even the traditional evening passeggiata when the main avenue in town would fill up with people eager to see and be seen whilst taking a gentle stroll around the centro storico, remained devoid of participants. We spent our time actively trying to escape the heatwave which had befallen Veneto. The temperature would often jump over 40 degrees Celsius and, seeking respite, we would follow the lead of the locals plunging into ice cold river waters and sunning ourselves on small pebbly beaches along the shores of fast flowing rivers and streams. We explored little villages snuggled up in the mountains where one could still feel a little bit of breeze. We toured a cave reached via an underground river and deeply enjoyed the momentary freshness of its constant temperature of 12 degrees whilst around us Italians were shivering wrapped in jackets. September rolled in with a little bit of torrential rain and as much sunshine as London rarely sees in its hottest summers. 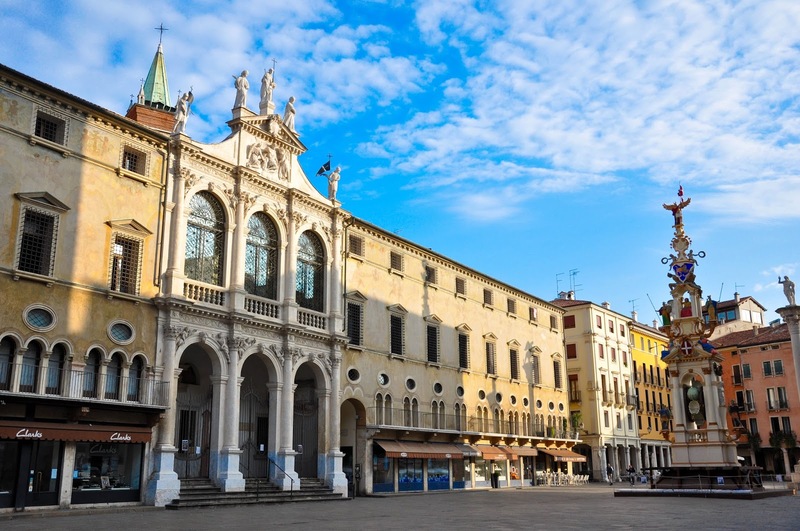 Overnight Vicenza sprang back to life with throngs of deeply tanned people returning from their holidays to their daily lives. 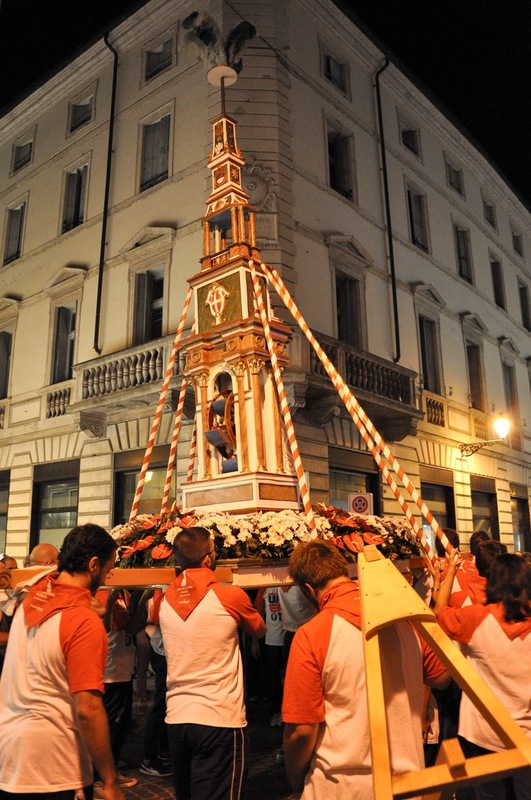 Large events took place, most notably Il Giro della Rua – a centuries-old traditional parade during which a large structure, called La Rua is slowly carried down the streets of the city. Having skipped its edition in 2014, the local authorities pulled out all the stops for its splendid return this year. 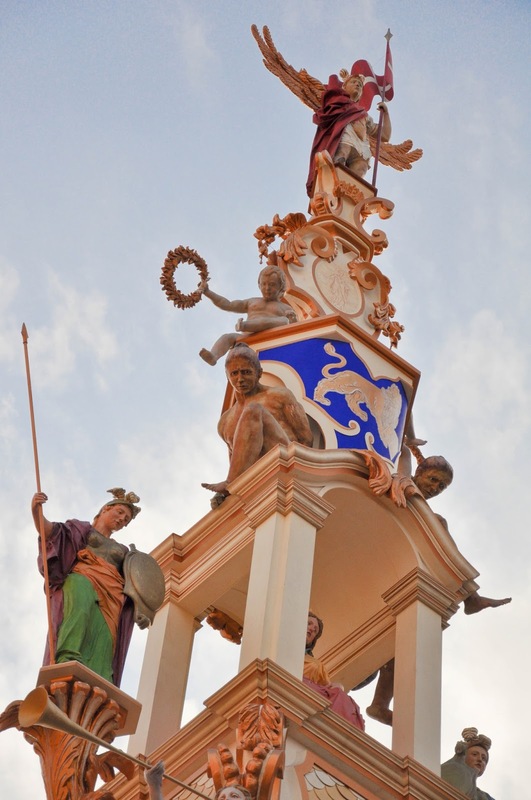 A large, 24-meter high Rua stood on the main square – Piazza dei Signori – all of September. And on the night of the 12th September, the parade took place with a smaller Rua being carried by young men followed by local groups and organisations dressed in historical costumes. People were lining up the streets to watch the parade and were applauding the Rua and its bearers. 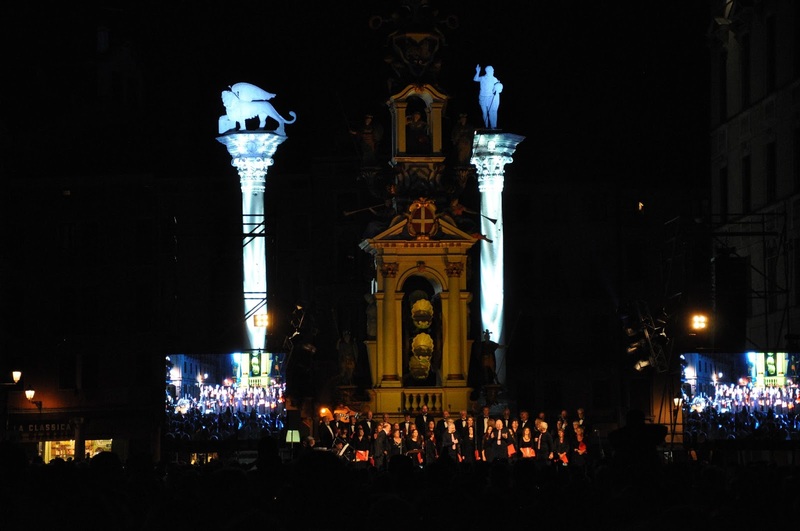 The parade made its way down the main avenue in town – Corso Palladio – and then converged on Piazza dei SIgnori, where a splendid show took place with lots of music, lots of talking and the most amazing light spectacle I had seen. 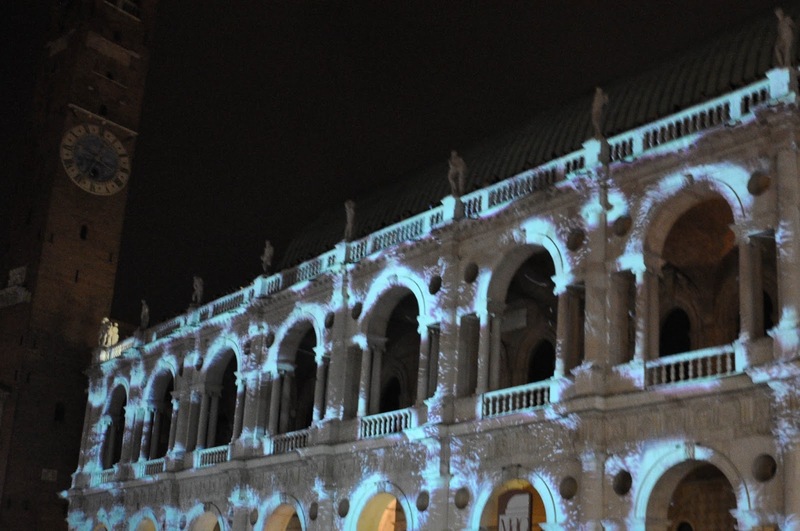 Light was beamed on the facade of the imposing Basilica Palladiana and it was made to dance on it. 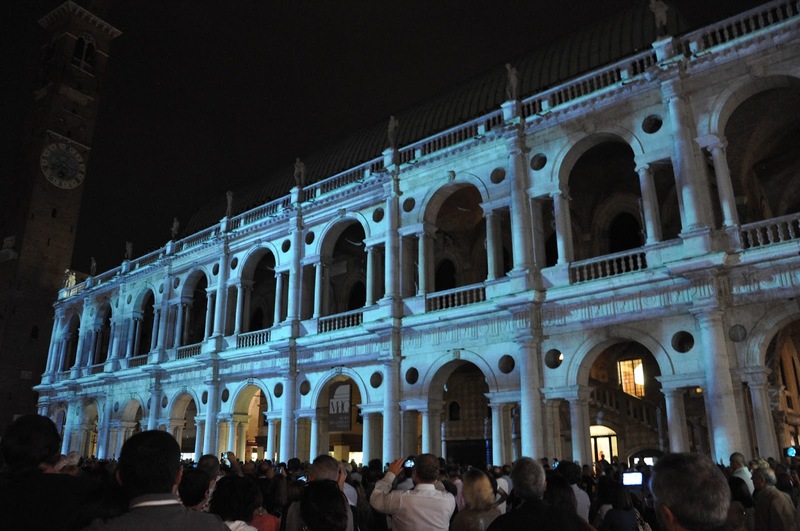 The illusion was such as the pillars and the arches of the building were moving up and down, jutting back and forth, rearranging themselves in a fabulous succession of rhythm and inspiration. 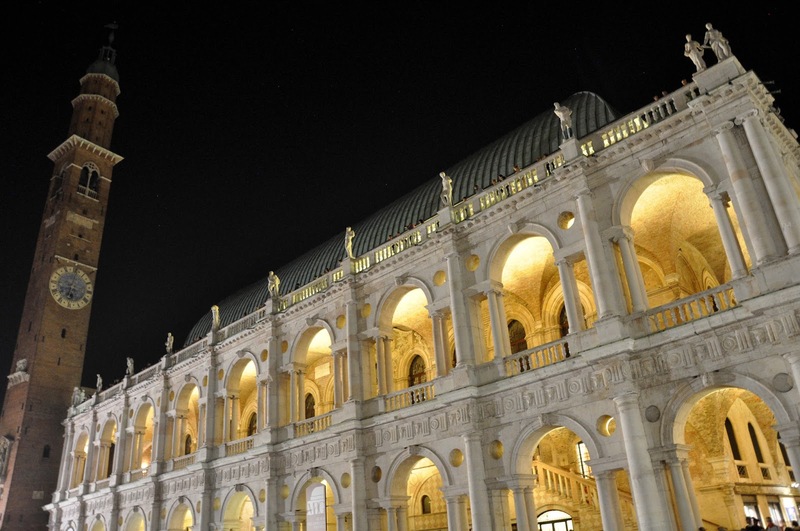 It was like Palladio himself – this most influential architect for the past 500 years in the Western world – had come out to play by rethinking and reshaping one of his most celebrated creations. Then autumn kicked in and although leaves have slowly started dancing down all the way to the earth and even though Italians, fashionable as always, are already wrapped in thick jackets and long scarves, the sun is still shining most days and it is not unheard of to reach a rather shocking 30 degrees. That is, until it started to rain the other day and the skies turned gloomy and grey. Yet, it will be all for a few days and then, based on my experience last year, a glorious Italian autumn will follow with lots of light, lots of sun and beautifully dressed-up (or would this rather be ‘dressed-down’) countryside. Snuggled on my blue sofa I am looking forward to all this. 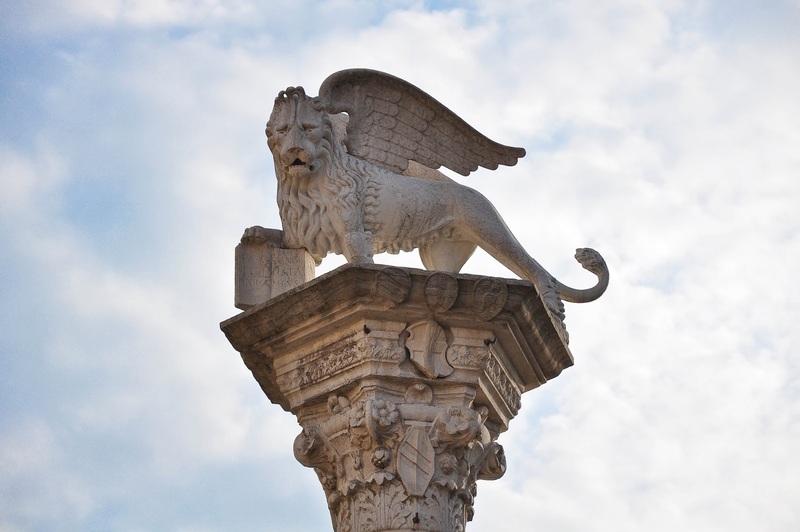 A sense of familiarity, a sense of being home and yet an exciting opportunity to keep exploring Veneto and Italy. Roll on chocolate festivals, Christmas markets and anything else in between. I am ready for it all! 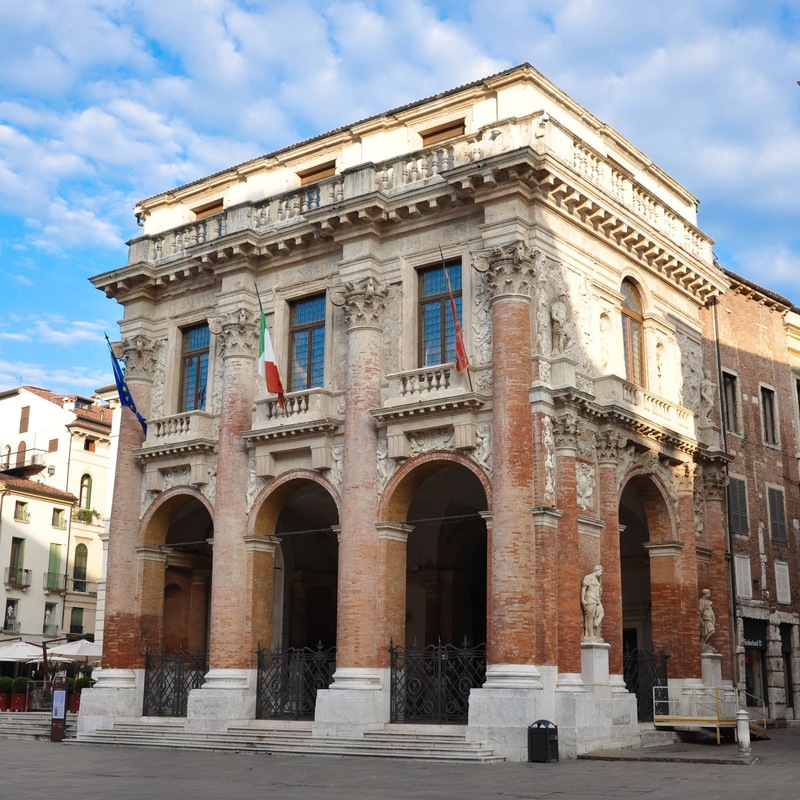 I lived in Vicenza when I was at SETAF -Army post there. it was beautiful. I miss it so very much. wish i had stayed, but it was difficult finding a job outside the military. 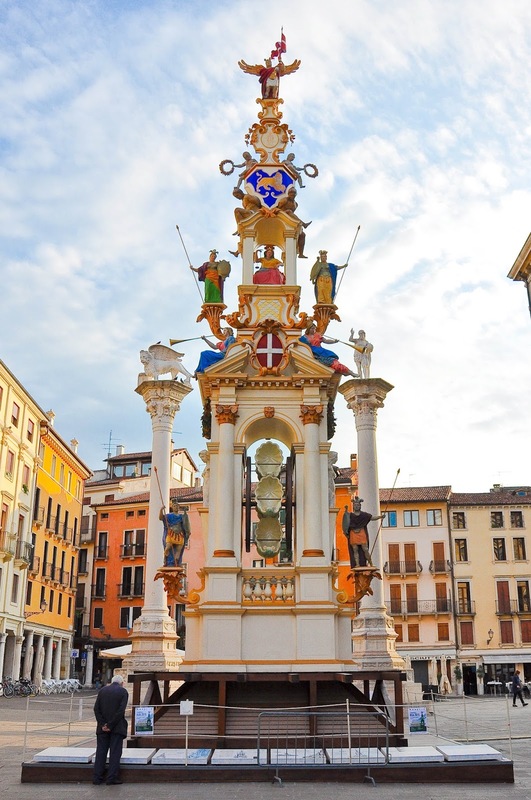 Back in America now but always dream of going back to Vicenza and taking the kids!